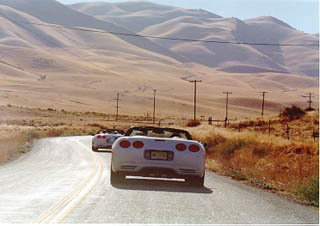 Theres Corvettes in the California Hills! When the invitation came to participate in a Corvette rally from Los Angeles to San Francisco, there was not a lot of thought process involved. Lets see, would I like to spend twelve hours in an open Corvette Convertible powering through the hills, mountains and valleys of central California? What was the question? As an adolescent who like to daydream about the freedom a car could give, what could be more inspiring then that old TV show, Route 66? Here was a chance for my associate Al and I to become real life Buzz and Todd, and with the new 1998 Corvette Convertible we even had enough room for luggage. The only thing we could not agree on was, who would be Todd and who would be Buzz. We easily packed our suitcases and large camera bags into the spacious trunk of our Nassau Blue Metallic Vette and slid into the Pewter leather seats. The top drops quite easily with a minimum of mechanical ingenuity necessary to perform the feat. I was particularly impressed with the solution the Corvette engineers have come up with to cover the top. The hard cover features several styling touches that make the convertible model look like it was the original design for the car, not just a marketing after thought. There are two bubbles that rise up directly behind the seats and a "waterfall" between the two seats. This piece of body color material brings the outside of the car into the cockpit in a fashion that is reminiscent of vintage Vettes of yesteryear. The rally was put together by the fine people from the Santa Barbara Sports Car Club. They spent some time the evening we arrived giving our group the Rally 101 course. We all needed much more preparations than our mounts did. Each Vettes was equipped with the standard four-speed automatic hooked up to the splendid 5.7-liter 345 hp V-8. Some bemoaned the lack of manual transmissions at the beginning of the rally. By the end of a very long day, everyone was glad for the automatic ability to use the Corvettes broad torque band with a minimum of effort. Our parking lot looked like an Easter basket filled by an auto-enthusiast. 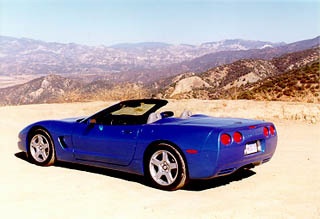 There were 28 1998 Convertibles in Blue, Red, Silver, White and Black. We started at one-minute intervals after one PM. The roads took us through a few small towns, but were primarily picked for their capacity to wander smack dab into the middle of nowhere. Back in New England we still have large areas of forest that could almost qualify as nowhere. Once you get away from civilization in California you are dozens of miles from any sign of man. For our team the rally went very smoothly. We arrived at our hotel outside San Francisco at 1 AM, or 4 AM body time. Too tired to get involved in bench racing, we crashed into bed. The next morning we found we had finished a very respectable 10th place. Chevrolet was very successful in conducting an event that was far beyond the usual ride and drive. This event amply showcased the power, comfort and versatility on the new Corvette. And at the same time it gave all of us insights into the realities of teamwork. Oh yes, and the scenery was so spectacular that Californias back roads should be declared a national treasure. This is Buzz (or is it Todd?) Signing off till next time.